It’s mid-June, and summer interns have taken over your office. They’re excited, nervous, and desperately want to make a good impression. As a full-time staffer, you should, too. Interns, and apprentices, undoubtedly get a lot out of summer programs—work experience, professional connections, potentially a full-time position—and are ultimately responsible for the success of their summers. But the rest of the office can, and should, help them thrive. In the end, both summer and full-time staffers gain from the new professional relationship that will hopefully last throughout their careers. I’m one of those summer staffers. I am working at Viget as a UX apprentice—a 10-week, industry-focused engagement that overlaps in part with Viget’s internship program. When I got the offer last spring, I was thrilled, but a bit nervous. I had completed several internships and worked full-time in the past, but an apprenticeship was new territory for me. I was also placed in Boulder, a city I had always loved from afar but never actually visited. Turns out, I had nothing to worry about. My first week at Viget completely exceeded my expectations. Orientation activities were thoughtfully designed and well executed; full-time staffers went out of their way to make all of us feel included. The warm welcome left me with a wonderful first impression of Viget as a company and the folks who work here. 1. Plan the first day from start to finish. Here’s a hint—we dread downtime. A well-planned first day starts the summer on a high note by giving us structure and purpose. A day that involves high-up people in the company is even better. That shows us you’re excited to have us here and committed to the summer programs. My first day at Viget consisted of a meeting with my mentor, paperwork, lunch with the office, a company presentation from Viget CEO Brian Williams, a design exercise, and an office-wide happy hour. Each part of the day had an explicit purpose. I left the office feeling comfortable with both my colleagues and the expectations of me for the rest of the summer. 2. Get everyone in the office on the same page. Avoid awkward introductions by making sure everyone in the office knows who the new folks are, when they are arriving, and what they are doing. Adapt this mantra as it makes sense for your office’s size and workflow—even a gesture as simple as sending a quick email the day of helps offset our nerves. There are two interns in Viget’s Boulder office with me this summer. As an apprentice, my focus is weighed more heavily on client work, and I am participating in some, but not all, of the internship activities this summer. Everyone I spoke with in the office understood the nuances of the positions, which made it all the easier for me to understand my own role. 3. Tell us when we do something wrong. For many, an internship is a first foray into an industry, perhaps even the professional world. We are not going to do everything correctly. Give us a chance to learn from our mistakes by letting us know when we mess up. Depending on the structure of your program, this task may fall to the internship coordinator or industry mentor, though even if you are not directly assigned to oversee us, please tell us if you spot mishaps. Viget holds weekly one-on-one meetings between interns and apprentices and their respective mentors (though in reality, my mentor Jackson Fox and I actually meet much more often). This is a good chance to get feedback on past work. 4. Cue us in on the culture. FLF? RPM? TTT? Phrases that are second nature to you might as well be Dothraki to us newcomers. While we don’t expect you—or would want you—to change your company vernacular, try to play translator until we’re up to speed. The same goes for company procedures. We may be totally comfortable asking questions about the work and industry, but hesitate to inquire about simple practices, like which food in the fridge is off limits and where to put our lunches. A primer on the office upon arrival goes a long way. 5. Invite us to look over your shoulder. We understand—you are busy with your own work, and mentoring us is probably not in the forefront of your mind. One time-effective way you can engage with us is by inviting us to shadow your meetings or watch you complete some task. Talk out loud while you work, and invite us to ask questions. We want to learn from you, not sit alone at our intern table. A classic intern table. Note: Don't do this. 6. Relax on the job talk. While not the aim for every company, most employers with internship programs say their primary goal is to convert students into full-time, entry-level employees, yet only half of internships nationwide convert to full-time positions. We know the stakes are high, but the focus of summer programs shouldn’t be solely on turning interns into full-time hires. Viget makes it clear from the get-go that the summer is about long-term learning and mentorship. They see the summer programs as a means to make lasting professional connections, whether at Viget immediately or down the line, or somewhere else entirely. These tips will hopefully start your summer folks off on a high note. Most of all, though, the best way to impress us is simply by being your awesome selves. If you are positive, happy, and enthusiastic about your work, we will be, too. You are a big reason why we—interns and apprentices alike—are all here. Thanks for taking a chance on us, and we can’t wait to get to know you. Viget summer staffers having fun in Boulder. 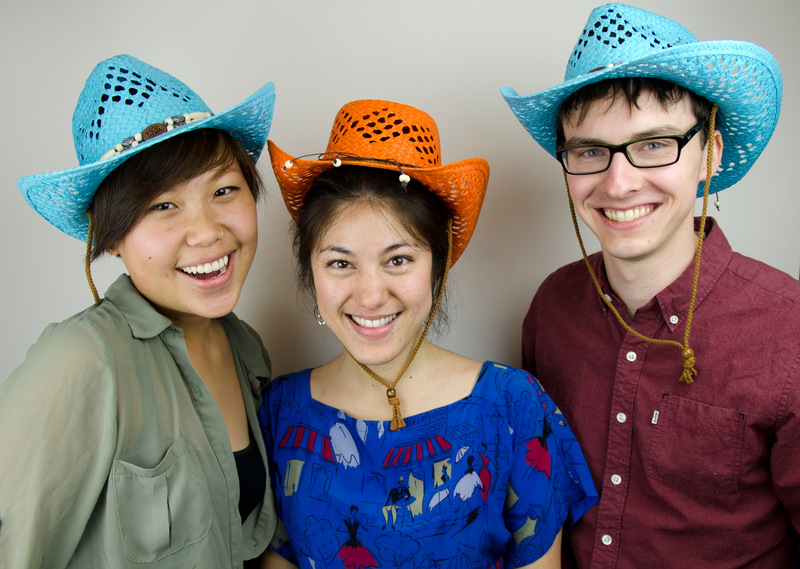 Pictured from left to right: Lillian Liu, Sanette Tanaka, Connor Lay. Introducing Viget’s Summer 2015 Interns!